Over two decades ago the City of Los Angeles in an effort to provide more affordable housing passed the Los Angeles Rent Stabilization Ordinance or LARSO. The ordinance set forth eviction for cause like non-payment of rent and other issues, as well as not for cause eviction. The Ordinance also set up a formula for the payment to the tenant for relocation assistance when the landlord wanted to evict a tenant in a rent control property for a not for cause eviction. The landlord evicts for the occupancy for her/himself, spouse, grandchildren, children, parents or grandparents, or a resident manager (Los Angeles Municipal Code (LAMC) 151.09.A.8). Landlords must comply with the restrictions and requirements of LAMC Section 151.30. The landlord seeks in good faith to recover possession of the rental unit to demolish or to remove the rental unit permanently from rental housing use (LAMC 151.09.A.10). These are considered Ellis Act (California Government Code 7060.4) evictions and the landlord must comply with the requirements of LAMC 151.22-151.28. The unit requires permanent eviction due to a primary renovation in accordance with a Tenant Habitability Plan accepted by the HCIDLA (LAMC 152.05). The landlord evicts to comply with a governmental agency’s Order to Vacate (LAMC 151.09.A.11). Landlords must file a Landlord Declaration of Intent to Evict prior to giving notice to tenants. The Secretary of Housing and Urban Development is both the owner and plaintiff and seeks to re-cover possession in order to vacate the property prior to sale (LAMC 151.09.A.12). The eviction is due to a Residential Hotel Unit conversion and demolition (LAMC 151.09.A.13). The landlord seeks to recover possession of the rental unit to convert the subject property to an affordable housing accommodation (LAMC 151.09.A.14). The landlord demolishes the property or converts the use of the property to condominiums, stock cooperatives, community apartment projects, hotels and commercial uses, regardless of whether the property is subject to the RSO (LAMC 47.06 & 47.07). The amount of the relocation payment will depend on whether the tenant is an eligible or qualified tenant, the length of the tenancy, and the tenant’s income. The amount paid is per unit and not per tenant. A qualified tenant is a tenant who on the date of the service of the Notice of Termination if 65 years of age or order, handicapped as that term is defined under California Law, or disabled, or a tenant who has one or more dependent children as determined for Federal Income Tax Purposes. An eligible tenant is any other tenant subject to a not for cause eviction and the amount to be paid for relocation will depend on the length of tenancy and the income of the tenant. A third type of tenant who will be paid relocation assistance is the low-income tenant who income is 80% below the median income adjusted for household size. 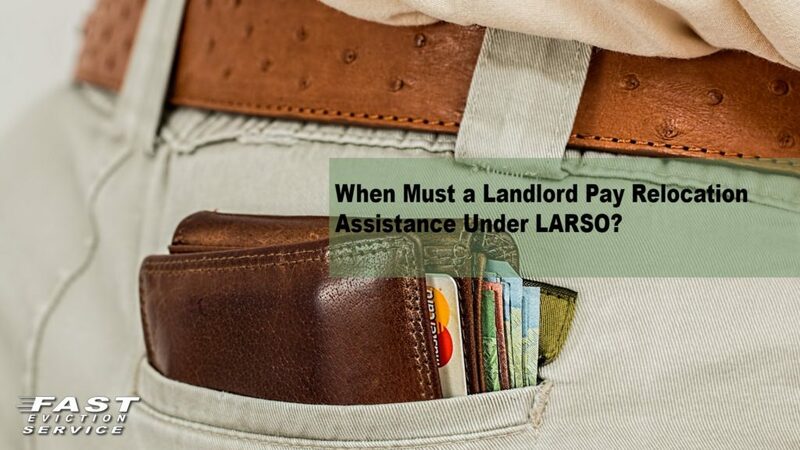 How and when is the landlord required to make the payment? The following are the stated exemptions from Relocation Assistance Payments. Mom and Pop properties may pay reduced relocation assistance payments to their tenants for a good faith eviction for occupancy by the owner or eligible relative, provided that requirements in Section 151.30 of the LAMC are met. Any eligible relative for whom the landlord is recovering possession of the rental unit does not own residential property in the City of Los Angeles. The tenant received actual written notice, prior to entering into a written or oral tenancy agreement, that an application to subdivide the property for condominium purposes, or to convert the building to a condominium, a stock cooperative, or community apartment project was on file with or had been approved by the City. The payment of relocation assistance under the Rent Stabilization Ordinance can be a very complicated process for even the most experienced landlord. It is strongly recommended that you gain the help of a competent Landlord Eviction Lawyer who is experienced guiding landlords through this process and in negotiating with eligible and/or qualified tenants and their attorney’s settlement agreements that can have a major impact reducing the size of the relocation payments substantially.